Did this event ever take place? Watch the video and read the details below to make up your own mind. The Voice on the Ohio River. 2.3 William Branham initially said he didn't know what it meant! 2.5 Who is Edward Colvin? One day at the foot of Spring Street, Jeffersonville, Indiana, after a two week's revival, I was baptizing 130 people. It was a hot August day and there were about three thousand people present. I was about to baptize the 17th person when all of a sudden I heard that still, little voice again and it said, "Look up." The sky was like brass on that hot August day. We had not had any rain for about three weeks. I heard the voice again, and then again the third time it said, "Look up." I looked up and there came from the sky a big bright star which I had seen many times before but that I had not told you about...After a few seconds had passed, I screamed and many people looked up and saw the star just over me. Some fainted while others shouted and others ran away. Then the star returned back into the sky, and the place where it had left was about fifteen feet square, and this place kept moving and churning about or as though waves were rolling. There had formed in this place a little white cloud and the star was recieved up in this little cloud. "As John the Baptist was the forerunner of the first coming of Christ, so your message is the forerunner of the second coming of Christ." Of course he alone heard the words though others heard the sound. This is exactly as it was when Paul was blinded by God and heard His voice. Others heard a sound but not the actual voice or the words of the voice. William Branham retells this story many times. Each time he tells the story, a light always appears when the 17th person is being baptised, and a voice says "Look up". However, there are some differences in each retelling. Originally, 130 people came to be baptized in August 1933 while 3,000 people watched. In later retellings, 500 people came to be baptized in June 1933 while 10,000 people watched. "As John the Baptist was sent to warn the people of the first coming of Christ, so is this Message to warn the people of the second coming." Both Gordon Lindsay's book, 'A Man Sent From God', and Julius Stadsklev's book, 'A Prophet Visits South Africa' record the light appearing during the baptism, but omit the voice. It is obvious that they received this information directly from William Branham without any checking of the facts. This provides witnesses to the prophecy of Jesus' return. However, the prophecy as retold by Gordon Lindsay refers to "this evangelist and others like him", while the prophecy as retold by William Branham only refers to himself. It is also interesting to note that the person that gave the prophecy, Anna Schrader, also prophesied William Branham's death in 1965. One must conclude that the since the voice was not mentioned in William Branham's own early retelling of the story that it never occurred and that he simply used the language from the Lindsay book. William Branham initially said he didn't know what it meant! The third time William Branham relates this story, (1951) he says that a voice spoke and that “many asked me what it meant. And I said, "I do not know.” If Bro. Branham did not know what it meant in 1951, why then does he know exactly what it means in August 1952? (see quotes below). William Branham said that the story was carried by a paper (1950), the "Courier Journal" (1951), the "Sunday Visitor" (1954), the "Louisville Herald", and the "Associated Press" (1961). We have conducted numerous searches in online newspaper archives. Microfiche sources in Indiana have also been searched. However, we have been unable to find any references to William Branham in 1933 other than an article from the Jeffersonville Evening News on June 2, 1933. It should be noted that this article does not mention a light or the Ohio River and casts serious doubt on the number of people that William Branham claims to have baptized. We must reasonably conclude that the story of the light appearing on the Ohio River was never reported in any newspaper. We must also conclude that William Branham estimates of numbers were wildly exaggerated. Willliam Branham mentions that Edward Colvin was being baptized when the light came down. If anyone would be a great witness to this event, Edward would be. But It appeared down there on the Ohio River before nearly ten thousand people while I was baptizing in August. I was baptizing some fi--five hundred, I guess, that afternoon. Hundreds of them was standing, and the choir singing, On Jordan's Stormy Banks I Stand. Was about two o'clock. We hadn't had rain for about two weeks. I had my seventeenth candidate I was taking out in the water. And I raised up, and I asked him if he believed. He had. He would been repented at the meeting? Yes. I raised up my hand, I said, "Father, as I baptize this boy with water, may You baptize him with the Holy Spirit." And as I started, Something went, whew [Brother Branham illustrates--Ed.] I looked up. I heard a Voice. Said, "Look up." Thousands standing all over the bank on the Ohio River facing Louisville. Paper carried a big article of it. And I looked, coming right down out of the heavens, out of a place about as big as this platform, where the blue skies churning like waters... Coming right down out of there came a big thing, like a star, whirling around, going, whew [Brother Branham illustrates--Ed. ], coming right down visibly before the eyes. Moved right down, looked like a star at a distance. When it got close, It looked like a milling fire of Light, moving right down and stood over where I was. Then went right back up into the heavens again. The waters let up. And papers carried a big article, "Mysterious Star Appears Over Minister While Baptizing." And on down, It kept coming. When I was baptizing hundreds down at the Ohio River at the foot of Spring Street in Jeffersonville, where thousands were blacked on the bank... At right at two o'clock in the afternoon, I was baptizing the seventeenth person. I started to pray, and thousands standing there looking. And down from the heavens came that green, whirling down like a big star in the distance. When It got close, It was that Light, a Pillar of Fire. I think It's the same One that led the children of Israel in the days that went before Moses. And It's in the church today. It's here tonight, the same Pillar of Fire. When He told me, He said, "As Moses was given two signs to vindicate his ministry, so will you be given two signs. And by these signs, that people will believe." And there It is. I believe It's the same Angel of the covenant. And He came down when hundreds and hundreds standing there, people fainted, and fell, and everything. The papers carried a great article, "Mystic star appears over minister at two o'clock in the afternoon while baptizing." There It was. Friends, settle yourself down. The hour has come. There's been a lot of "playing religion." There's been a lot of playing church. But the hour has come where God's calling out His people. That's right. And He's vindicating it by signs and wonders. And that's it. And here's the statement. Anyone's welcome to read it. It's here any time, and for anybody. And look at it. 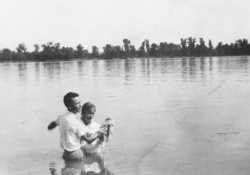 About twelve years ago, I was baptizing my first group after my--one of my revivals at Jeffersonville, Indiana, where I lived at this time--my home is, rather. And standing on the banks of the Ohio River where [Blank spot on tape--Ed.] had gathered out. And while I was baptizing... It was two o'clock in the evening, on June. And the seventeenth candidate, I was baptizing in water at the Ohio River at the foot of Spring Street. And I heard Something speak, and I felt Something take a hold of me. And I looked up. And when I did, coming down from glory came this whirl coming down where I was at. "Courier Journal Newspaper" packed an article of it, said, "A mystic star appears over a local Baptist pastor while baptizing in the river." They couldn't make out. Oh, up to probably ten thousand people saw It as It moved down where I was at, and went back up in the skies. Come right where I was and went back up into the sky. Well I... Many asked me what It meant. And I said, "I do not know." But I have seen times where whole audiences of thousands, ten thousand at one time seen Him coming right down at two o'clock in the afternoon and standing over where I was at, when the newspapers flashed it everywhere. Recently when I was baptizing on the river at Jeffersonville, when all the local newspapers packed It, two o'clock in the afternoon when I was praying, here It come right down out of the heavens, right at two o'clock in the evening, June, or in the afternoon, rather, in June, about the middle of June, hung right over where I was, and a Voice from It, saying, "As John the Baptist was sent to warn the people of the first coming of Christ, so is this Message to warn the people of the second coming." Right back up into the heavens, when people screamed, fainted. What is it? God, getting the Church ready. You don't need no new doctrine. You don't need no new theories. You need real true hearts to Almighty God, to believe on God, and His Son, Christ Jesus. Have fellowship with everybody, all the Christians, by the Holy Spirit. Amen. Even the Catholic "Sunday Visitor" spoke of it, of how many millions that come in around, just of the effort. Others hear and they say, "That's the Truth. I'm ready to sell out right now to these things of the world and go preach the real Gospel." So then I--then I was getting too critical on speaking with tongues, you see. But one day, then, how God vindicated that to me! I was baptizing down on the river, my first converts, at the Ohio River, and the seventeenth person I was baptizing, as I started to baptize, then I said, "Father, as I baptize him with water, You baptize him with the Holy Spirit." I started to--to put him under the water. And just then a whirl come from the heavens above, and here come that Light, shining down. Hundreds and hundreds of people on the bank, right at two o'clock in the afternoon, in June. And It hung right over where I was at. A Voice spoke from there, and said, "As John the Baptist was sent for the forerunner of the first coming of Christ, you've got a... have a Message that will bring forth the forerunning of the Second Coming of Christ." And it liked to scared me to death. And I went back, and all the people there, the--the foundry men and all them, the druggist, and all of them on the bank. I had baptized about two or three hundred that afternoon. And when they taken me out, pulled me out of the water, the deacons and so forth went up, they asked me, said, "What did that Light mean?" A big group of colored people from the--the Gilt Edge Baptist church and the Lone Star church down there, and many of those was down there, they begin screaming when they saw that happen, people fainted. The first thing, as a little, baby boy, three minutes old, the Pillar of Fire hung over where I was born in a little log cabin in Kentucky. All my life, It's come to me, giving me visions. I'm a Baptist preacher, out of a Missionary Baptist church, ordained by Dr. Roy E. Davis out of Dallas, Texas, and was made a local elder for the church at Jeffersonville. My first revival, five hundred came to Jesus Christ out of a three thousand congregation when I was twenty--about twenty-two years old. I was baptizing them down at the end of Spring Street in Jeffersonville, Indiana, in the Ohio River, when... nearly seven or eight thousand people standing on the bank, bear witness, that two o'clock in the evening, June, 1933, how that a Pillar of Fire come down out of heaven, and hung over where I was standing. The "Courier Journal," and "The Times News"... no, it was the... [Brother Branham snaps his fingers--Ed.] Oh, I'll get the name of the paper just in a minute, [He snaps his fingers again--Ed.] if I could think of it, the Louisville paper: great article: Mystic Light Appears Over Local Baptist Evangelist While Baptizing At River. Very mystic thing, people could not understand. Many fainted at the Presence of It. The Angel of the Lord come right down and hung over where I was. The "Louisville Herald" is what it was, "Louisville Herald, Herald Post" of Louisville, Kentucky. I am so happy tonight. I've been out across the mountain there today as soon as I got through with the interviews that I had to have, and went over to pray. And every time I get in this desert sun it kind of makes me want to come back more. But one thing that I'm happy about tonight, my wife... As much as we have been together, and she's seen the great visions of God manifested and come to pass. She was down at the river that day at Jeffersonville when the Angel of the Lord made His first appearance; it was packed on the Associated Press across the nation. Been a... It was 1933. She was standing there, but she heard the Voice but didn't see the Light. Where, even the newspaper photographers saw the Light. But she was quite young then, and about twelve years old, and she never seen the Light. She was watching the people, many were fainting. And it just stayed there just about one minute and then it went right straight back up into the skies again. And the newspapers put a great article, "Mystic light appears over--over a local Baptist minister while baptizing." Went all the way into Canada, got on the Canada press. I want to tell you, whi--while we're singing this song, the... I was standing, five hundred at the Jeffersonville, thirty-one years ago, my first revival, singing, "On Jordan's stormy banks I stand, and cast a wishful eye, to Canaan's fair and happy land, where my possessions lie." And I walked out baptizing five hundred that afternoon, as a Missionary Baptist preacher. The seventeenth person I baptized, all at once I heard Something say, "Look up." And I looked, and here come that Pillar of Fire circling down out of the heaven. Stood right over where I was at and said, "As John the Baptist was sent to forerun the first coming of Christ, your message will forerun the second coming of Christ." When the Baptist preacher laughed at me... That went on the associated press. "A Mystic Light Appears Over A Minister While Baptizing." All up into Canada and everywhere else it went on the associated press. Hundreds and thousands of people saw it. Look at it today, brother. Look, its promise is true. "On Jordan's stormy banks I stand, and cast a wishful eye." We been in this wilderness long enough; let's go towards the promised land. Pulling back here, just don't... Pray, just pray for me. See? Maybe out here. Our time will be tonight. Sets right in quick. I like that. Oh, you don't know how I feel. By the way, have you bought your picture of it yet? How many ever seen the picture of that Angel of the Lord? They've got it back there. You can get it. It was taken over here; it's in Washington, DC in the Religious Hall of Arts: only supernatural Being ever photographed, a Pillar of Fire. Years ago, as a little boy, when I was baptizing down on the river that day, just my first message in the Missionary Baptist church... I was baptizing five hundred. And that afternoon, on June, 1933, on June, about the 15th, here come that Pillar of Fire whirling out of the skies, like the pretty, sunshiny afternoon, and go right down in that Voice and shook the whole country round there, said, "As John the Baptist was sent to forerun the first coming of Christ, your Message will forerun the second coming." Now, it's started a revival immediately after that. And there it's went across the nation, around the world, Pentecost reviving. And that's what has taken place, the second coming of Christ. And now, the newspapers packed it way up in Canada. It was on articles, and so forth, and went on the Associated Press. I kept telling people. Then finally the eye of the camera begin to catch it. And now they've got it back there. Now, how many knows that that Pillar of Fire was Jesus Christ, the Angel of the covenant? Sure. Sure. Now, look. When He was here on earth, He said, "I come from God, and I go to God." Is that right? "I come from God; I go to God." After His death, burial, and resurrection, Paul (Saul then) was on his road down to Damascus to arrest some people that were making too much noise, shouting and going on. That day down there, about thirty-three years ago, or thirty-four, standing on the banks of the Ohio River there, at the bridge, and about five thousand people or more gathered on the banks. I was just about twenty years old, twenty-three, twenty-two or twenty-three years old, my first revival. I was baptizing five hundred people, that afternoon. And the deacons had led me out in the water. About the seventeenth person, when I was baptizing, I heard a Voice say, "Look up." And I turned to look up. Billy's mother, we wasn't even married then, just going together. Here come that Pillar of Fire, circling out of the bright blue skies, at two o'clock on June the 15th, coming right down out of the skies, like that. And a Voice roared out, all over the place there, and said, "As John the Baptist was sent forth to forerun the first coming of Christ, you have the Message that'll now forerun the second Coming of Christ." Photographers taking the picture. I remember, on the river down there, when I was a young Baptist preacher, and was baptizing there. About ten thousand people standing on the bank, when one afternoon... My first great revival, somewhat around a thousand converts, and I was baptizing them out there in the water. The seventeenth person, I was leading out into the water. And I heard a noise, and I looked around. It was hot. It was on June, 1933, at the foot of Spring Street at Jeffersonville, Indiana. I was leading them out there. And the banks, all up-and-down, was just crowded with people. I walked out with this little boy. I had seen him at the altar. I said, "Son, have you accepted Jesus Christ to be your personal Saviour?" He said, "I have." His name was Edward Colvin. And I said, "Edward, do you know what I'm doing now?" He said, "I do, Brother Branham." I said, "I am baptizing you, showing to this audience out here, that you've accepted Christ as your personal Saviour. When I baptize you in the Name of Jesus Christ, you take on His Name. You rise for a new life. And when you leave here, you're to walk a new life. Do you understand that, Edward?" He said, "I do." I said, "Bow your head." 150 I said, "Heavenly Father, as this young man has confessed his faith in You. And as Thou hast commissioned us to 'go into all the world and preach the Gospel, baptizing them into the Name of the Father, Son, and Holy Ghost,' commissioning them to believe all things which You have taught." "I therefore baptize thee, my beloved brother, in the Name of the Lord Jesus Christ." And as I laid him into the water, I come up, I heard something going, "Whooosh!" I looked at the crowd, and it... I heard a Voice say, "Look up!" I thought, "What is that? Billy here, his mother, two or three years before we was married, she was standing there. I seen her face, white. She had a camera in her hand. "Look up!" I heard it the second time. I was scared. I looked around, the people standing there just looking, just dumfounded. I heard it say again, "Look up!" And when I looked, here come that same Pillar of Fire that led Israel through the wilderness. Thousands of eyes looking at It coming right down over where I was standing. And said, "As John the Baptist was sent forth to forerun the first coming of Christ, your Message shall cover the earth and forerun the Second Coming of Christ." That went into the newspaper, on the Associated Press'. Doctor Lee Vayle, here this afternoon, picked it up, plumb in Canada and around, "Local Baptist preacher, while baptizing, a mystic Light appears over him." Followers of the message believe that Bro. Branham was anointed with the spirit of Elijah as prophesied in Malachi 4, verse 5. But where does this belief come from? Believers will most often point to a light that appeared on the Ohio River in August 1933 and a voice that spoke from this light saying "As John the Baptist was sent to forerun the first coming of Christ, your Message will forerun the second Coming." Let’s look at the progression of this testimony over the years from William Branham’s own words to see how this mystery unfolded. The story was first told in three published documents. And in Gordon Lindsay’s book “A Man Sent From God”. None of these reports mention a voice speaking as we just mentioned. About twelve years ago, I was baptizing my first group after my--one of my revivals at Jeffersonville, Indiana, where I lived at this time--my home is, rather. And standing on the banks of the Ohio River where [Blank.spot.on.tape--Ed.] had gathered out. And while I was baptizing... It was two o'clock in the evening, on June. And the seventeenth candidate, I was baptizing in water at the Ohio River at the foot of Spring Street. And I heard Something speak, and I felt Something take a hold of me. And I looked up. And when I did, coming down from glory came this whirl coming down where I was at. Lee Vayle states in his book “Twentieth Century Prophet” that William Branham was the only one that heard the words that were spoken. And while William Branham indicates that Lee Vayle read of the event in a newspaper, Lee Vayle makes no mention of this in his book. We have also been unable to locate any newspaper stories that relate to this event. First, William Branham never mentioned a voice referring to “John the Baptist” until 1952, and neither Gordon Lindsay nor Julius Stadsklev refers to the voice in their books. Second, William Branham was the only one who heard the voice. Third, Gordon Lindsay recorded a different interpretation given by Anna Schrader than the one that William Branham remembered years later. It is interesting that Anna Schrader’s interpretation is the first reference to a message like that of John the Baptist’s, but it covers not only William Branham but also the other evangelists associated with the healing revival. Is this the voice that William Branham actually heard? Another problem is that there do not appear to be any newspaper stories in existence that reported on the story told by William Branham. These changes to the story over time are very significant, and don’t agree with the earliest records of the story. Isn’t that a little suspect? ↑ 52-0817E - Do You Now Believe? This page was last edited on 23 May 2017, at 22:01.